Skill and compassion go hand in hand when providing exceptional patient care. As dental professionals, we stay up to date on the latest advancements in dentistry in order to provide the most current treatment options for our patients. As doctors, we recognize that our patients are unique individuals who have placed a great deal of trust in our team. That is just one reason why we value each and every patient relationship. After graduation from the Indiana University School of Dentistry in 1976, Dr. Gary purchased a dental practice in Greenfield, IN from his great uncle (Dr. Allen). He maintains that practice today. 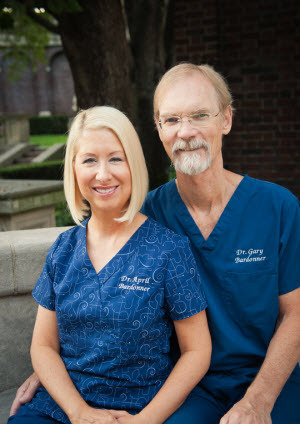 Dr. April worked as a hygienist in the Greenfield office where she met Dr. Gary. They were married in 1987. Following her graduation from dental school in 1990 she purchased the Columbus, IN practice from Dr. Lowell Daffron. Dr. Gary has a daughter Dr. Cierra Tabony, a veterinarian in North Carolina. Cierra has two children, Carter and Arden. Dr. Gary and Dr. April have one daughter, Alexis, who is currently a student at Xavier.